What is there to say about a place called Pies ‘n’ Thighs? They have great pies and, oh my, what fine thighs. Seriously? They serve up delicious fare at affordable prices. Have you seen their chicken biscuit? It’s only $5.50 and that will keep anyone satisfied for days on end. I ordered the Fried Chicken Box ($12.50), which came with a dense, buttery biscuit, three pieces of chicken, and one side. I chose macaroni and cheese, although I thought about trying their grits–which, I’m sure, are phenomenal. The biscuit is best eaten with a bit of honey, but the chicken needs no embellishments. It’s salty crust embodies the epitome of fried chicken perfection. Greaseless, and after three whole pieces, I don’t feel like I’m going to vomit. Think about the last time you went to Popeye’s. Or don’t. A drizzle of hot sauce nicely accented the creamy mac ‘n’ cheese’s delicate flavor. I enjoyed this dish, but would definitely try one or more of their other sides next time. My dining partner, Goody Wang, ordered the Catfish Box ($12) We both lamented the lack of boxes around our food. If there’s something Pies ‘n’ Thighs might change about their presentation, it’s definitely boxes. (Did you know I am listening to Justin Bieber as I’m writing this? What the hell?) She said her food was excellent as well. We ordered requisite pies, one slice for each of us. I got the banana cream pie and she tried the fried apple pie with ice cream. Whoa, did I just say fried apple pie? Like chicken fried apple pie? Almost, but not quite. 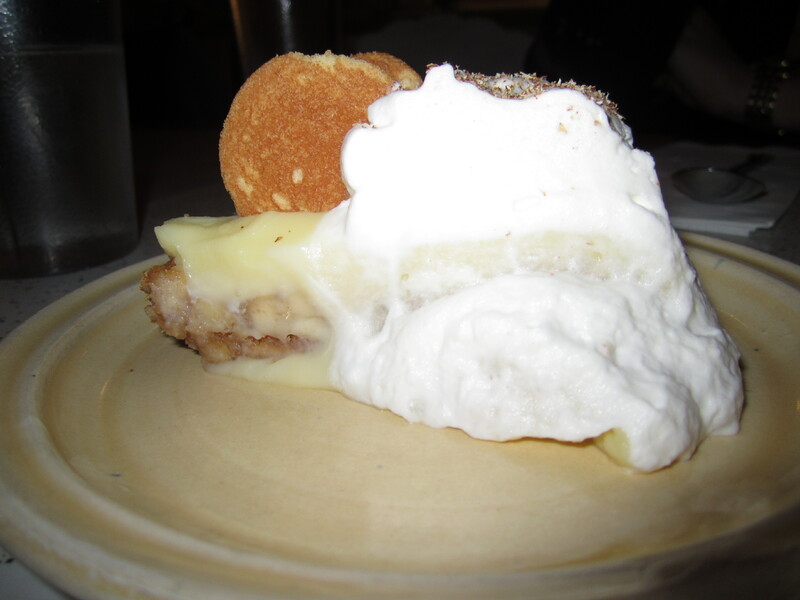 The banana cream pie’s difficult-to-cut crust had a distinct flavor that I cannot place. Her fried apple pie was coated with granulated sugar and piping hot. Yum. 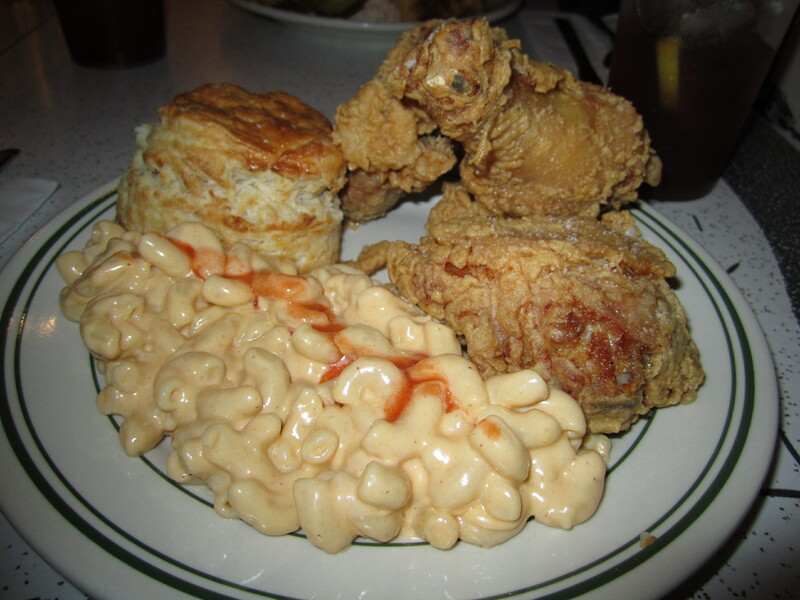 I highly recommend Pies ‘n’ Thighs–especially on a week night. You might try one of their boxes (they also have a Brisket box), or opt for the chicken biscuit. Whatever you eat, you’ll be beyond satisfied. omg m’cake – it’s about friggin time you wrote about Pies N Thighs! I have been jonesing for fried-chicken-that-I-do-not-have-to-make-myself. And I can, just fine, thank you. But my biscuits aren’t as fluffy. Yet. Could you say a bit more about the banana cream pie’s difficult-to-cut crust? Stale Nilla wafers perchance? There is nothing oxymoronic about fried apple pie. Perhaps you did not know that fried peach pies are the food of the goddesses. Is that home made whipped cream on the banana pie or did it come from a can? ?